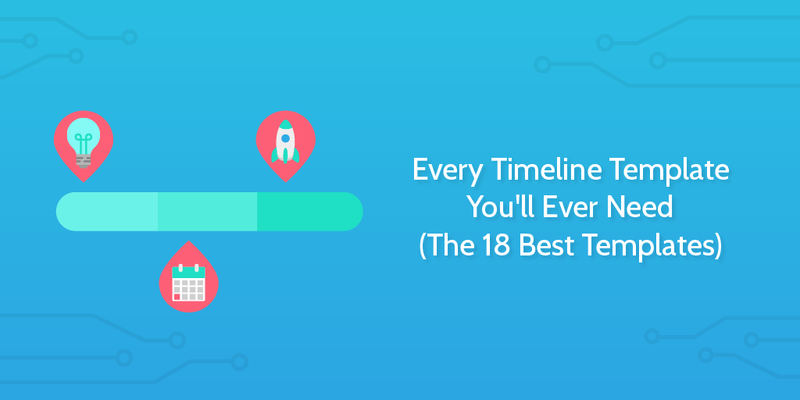 Using any of the following 18 timeline templates will cut the fuss out of presenting your data in a way that’s easy to understand and visualize. Whether you’re showing off your company’s milestones to potential investors, breaking down a project into individual tasks for your team, or just organizing your week to come, these templates will let you forget about formatting and get straight down to recording and using your relevant data. One final note before we begin – this obviously isn’t a list of every free timeline template on offer. Although I trawled through many results, only these 18 were either useful or different enough from each other to be worthy of a separate listing. 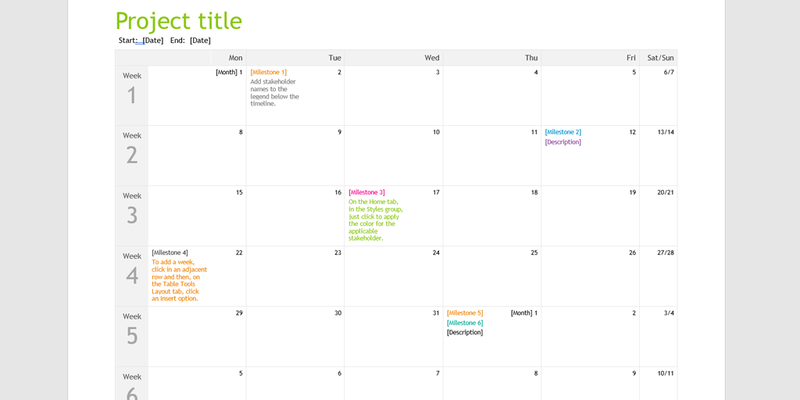 Calendars are fantastic for laying out both personal and professional timelines. Depending on how much detail you want to use, you can plan out your milestone events with brief overviews of each month, or actively plan out how you’ll spend your time with specific events and deadlines. 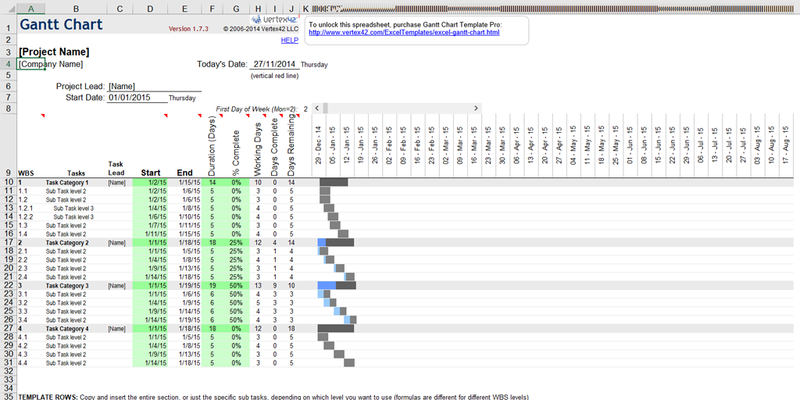 The main limiting factor for calendar timeline templates is the format you use. Programs such as those in Office 365‘s suite (Microsoft Word and Powerpoint) can do a serviceable job of layout out a calendar, but when it comes to customization or any reasonable level of detail, you’ll quickly be left behind with awkward editing and broken formatting. Apps such as Google Calendar, however, allow you to plan out milestones, tasks, projects, and events in great detail and with huge amounts of flexibility, at the cost of taking a little extra time to set up. Kicking us off we have a couple of templates from Microsoft, starting with a basic timeline template for Microsoft Word which splits the year into months with a small space to describe what’s happening in each. Obviously, you’ll have to edit the year, but if you’re planning high-level goals which can be summed up in a single sentence this isn’t a bad choice. If, however, you’re looking to plan out your timeline in any kind of detail, you’re better off using one of the other options in this post. Word makes it awkward to edit anything that isn’t plain text, and so I would advise against trying to space out the months to cram more detail in – chances are that will break the format. This timeline for PowerPoint is much more akin to a traditional calendar, letting you make more detailed noted on a day-to-day basis. This template also comes with a couple of sample milestone placeholders to show you how you could use it to plan out your projects or goals (which is especially handy if you don’t have a set project proposal template). While this template is much more versatile than those in Word, there are still limits to what you can do while sticking to this calendar layout. You can still only write a sentence for each day, and while that will cover most situations, it won’t allow you to go into any detail or describe more than one event. If you’re organizing your time using a calendar I’d highly recommend using Google Calendar. Serving as part of the Google Suite, Google Calendar is a free app which lets you create events with which you can organize your time effectively. From daily routines and deadlines to overarching goals and projects, you can color code your events and stack them to overlap to dedicate your time to the things that need doing. Better still, you can print off your calendar for free to serve as your very own timeline template. Admittedly, if you edit your calendar then you’ll need to reprint it, but if you use the app to track your tasks in the moment and then only print off copies for your records you’ll never need to worry about whether you’re using an outdated version. Click here to learn how to print off your calendar. Linear timeline templates are more milestone-based than calendars, as they are only really viable for showing longer periods of time with minor details. However, they are also far less reliant on specific dates, making them more versatile for projects and goals which don’t have set deadlines or are still in the planning stage. These timelines are also fantastic for summarizing a project to your teammates or manager, since the flow of one task to another makes it much easier to understand how everything will fit together and progress. 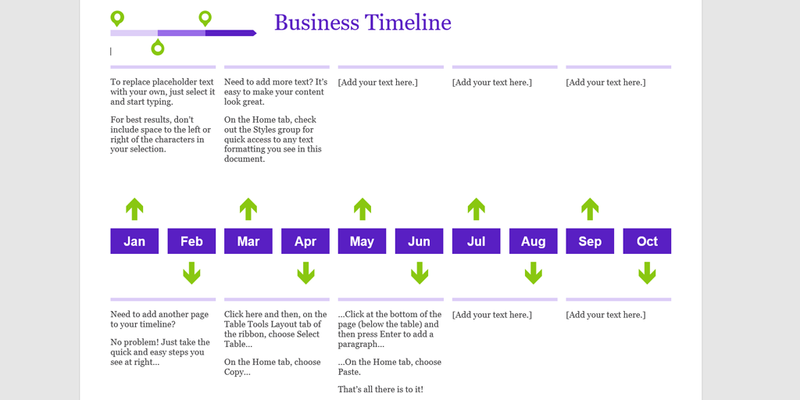 In other words, if you’re less certain of specific dates or want to present a bitesize version of your timeline in a way that’s visually easy to understand, use one of these linear timeline templates. Another official Microsoft template for Word, this timeline has many of the same pros and cons as their calendar template for the same program. If you’re looking to give a brief overview of each month over a sentence or two then this timeline is easy to customize and displays its information clearly enough (especially for the ease of use with everything set up for you). If you’re looking to customize the template beyond the flavor text for each month, it’s not really worth the effort. Again, Word is horrible to use when editing anything other than plain text, so if you need to give a more detailed timeline overview, you’re best using a different template. Otherwise, it’s easy to use and gets the job done. What more can you ask for? I’ve already said that linear timelines are great for presenting milestones or task flows to others, and this chevron template doubles down on that by being a PowerPoint file. 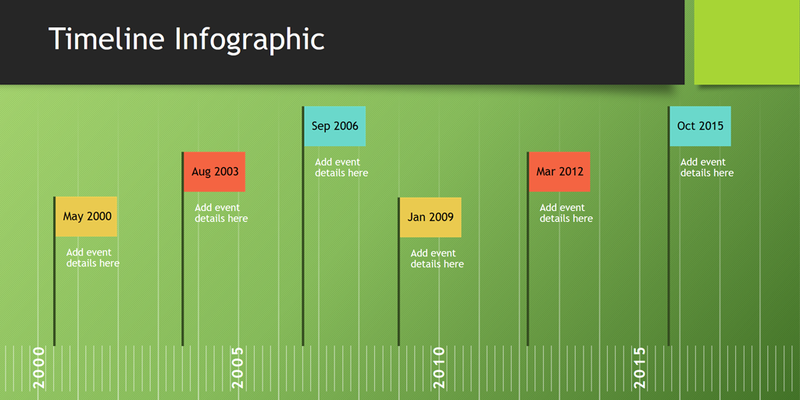 Although a little basic, this timeline is a great starting point for a presentation where you need to show a timeline to others. It’s not overly pretty, and anyone viewing it will probably know that you’ve taken a template and customized it, but for a basic presentation aid you couldn’t ask for a better starting point. Much like the Word timeline template though, this one is severely lacking in customization options beyond changing the basic bullet points below each month. PowerPoint makes it much easier to edit visual elements (like the individual chevrons) than if you were working on a Word document, but the best way to give more detail to your timeline is to create separate slides to break down each month of your timeline further. 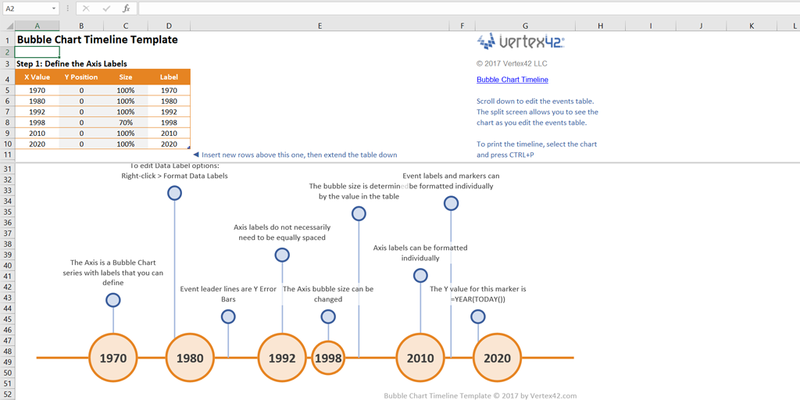 Vertex42‘s bubble chart timeline is a little different, as it generates its timeline and visuals from two graphs you can edit in Excel. This is a great template for if you want to add a little flare to your timeline and are willing to have a bit of a tinker with the tables provided to get the results you’re after. 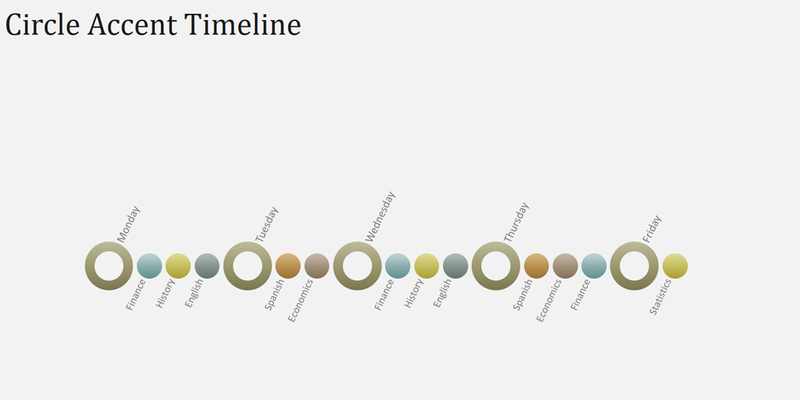 With options to change the number, size, and contents of each bubble, along with the X and Y axis positions and the message which springs off each, this is perfect for if you’re looking to produce a more traditional timeline which won’t bore whoever’s viewing it to death. If, however, you’re looking to split a project into tasks, the lack of room for detailed text is a major drawback. Template Lab‘s PowerPoint template is a cross between a traditional linear timeline and a project-driven one, in that it uses the linear timeline to give the time scale, and then supplements it with bars showing how long the various phases of a project will take. This makes it useful for managing a team, since everyone can visualize how far along a phase they are and how much time they have let to complete their tasks. Once again, you won’t be able to give a massive amount of detail for any given phase or task, but for presenting an overview of a project and breaking it down into actionable milestones this is a great visual aid. Plus, with it being PowerPoint, there’s nothing stopping you from expanding on each phase in a new slide. One of the brighter timeline templates in our lineup, this entry from Microsoft has all of the same pros and cons as other PowerPoint timelines, but its design leans more towards being a visual piece than heavy practical use. With the scope of the timeline spanning several years and the limited space for more than six highlights, this timeline is more useful for presenting something like the company’s history or milestones than anything at a lower level. That’s not necessarily a bad thing – being able to show the major events in your company’s history is a powerful tool to use with both customers and potential investors – but that does mean this timeline template is less useful in your day-to-day activities. If you’re looking to summarize your major victories or progress points to a specific person or in a shared document (like an employee handbook) then this is a great start. 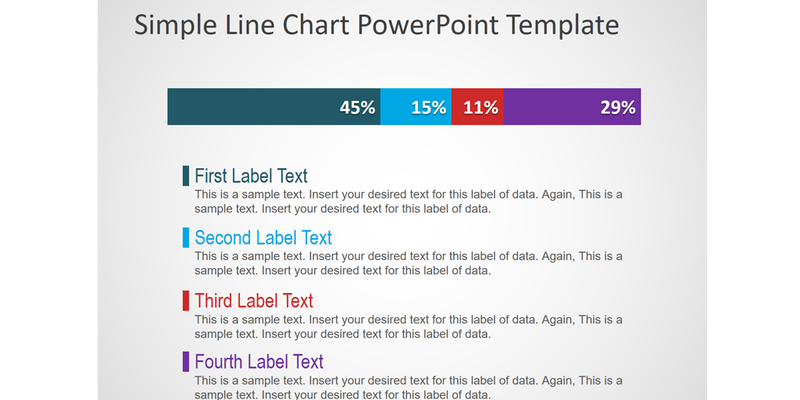 While it’s not as “professional” as many of the other templates here, this PowerPoint template is a nifty little timeline to split up your week into color-coded tasks at a glance. Although it’s currently set out as a study/lesson schedule, you could easily swap this to have your tasks prioritized and recognizable at a glance. Instead of even having to read your text your could know that (for example) on Monday you have to research a blog post, write another, and edit a third from the color and position of the following circles. Alternatively, you could use it as a company-wide display of deadlines or meeting times for different teams, with each team having a set color. This could help increase accountability, since everyone will know when each others’ deadlines are, and if any teams are collaborating it will be even clearer when they need to have their tasks completed to hand off to the other team. 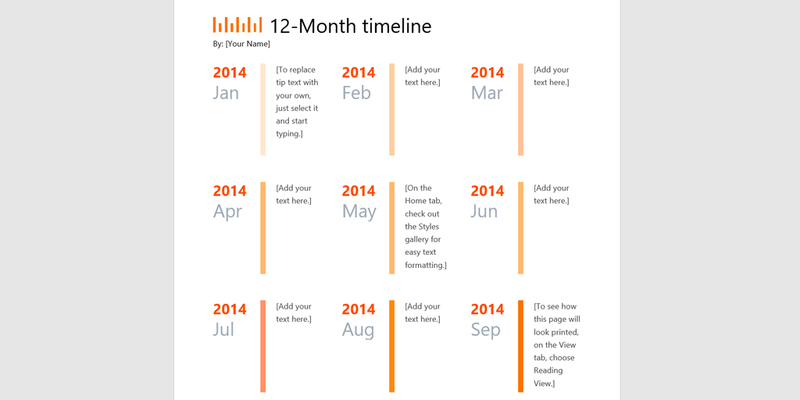 This Excel timeline from Microsoft stands out primarily for its color scheme. Having a striking white-on-black presentation with blue milestones will draw the eye of anyone skimming past it, while the milestones themselves are easily customizable. Changing the data in the table below the timeline will automatically update the graph (the wonders of an Excel formula), making it incredibly easy to customize both the name and position of each point on the line. However, the reverse color scheme comes with a big downside. As Ogilvy tells us in his core marketing tips, having white text on a black background is naturally harder to read than the reverse, so you’ll want to avoid putting too much detail into your timeline. It’s eye-catching, but not conducive to easy reading. These are templates which focus on breaking down a project into its individual elements (and that don’t fit into a “linear”, “calendar”, or “spreadsheet” format). As such, these are best used when you’re looking to break down a specific project without focusing on timings. For example, if you’re making a project proposal and want to suggest a timeline in terms of what the work cycle will look like, how long a stage might take (without set timings), and how the work will be distributed, these are the templates for you. Slide Hunter‘s PowerPoint template focuses entirely on breaking up the amount of work behind every stage of a project. A single progress bar is split up into colored segments to show the amount of work for each, while a small description of what each color stands for is shown below. As mentioned earlier, this project work timeline is best used to support a project request form and show the distribution of work in what you’re putting forward. 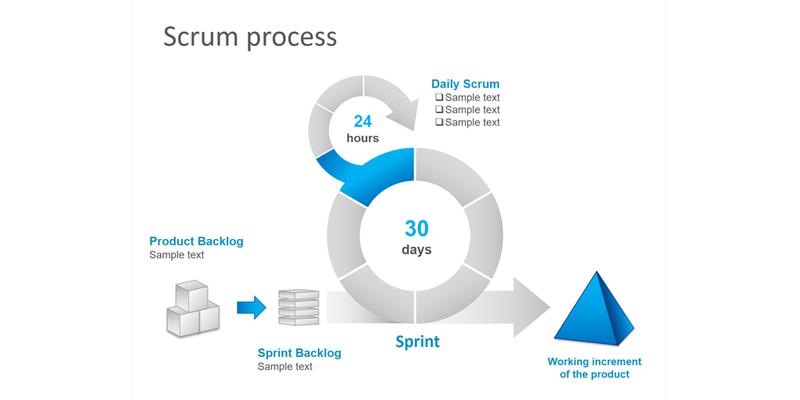 Once again from Slide Hunter, this Scrum timeline is a high-level overview of the process which is best used as part of a presentation. Although at first it might seem too generic to be useful, if you’re presenting a product to either begin work or as part of a postmortem, this is a great way to summarize both how your Scrum operates and how long each cycle will take (or took, if you’re analyzing a completed project). You could run this as part of your daily Scrum (since there’s a small space to fill in your daily tasks), the huge visual elements make this much more suited to giving a snapshot of the process in a presentation. For an actionable process which you can use to track your daily Scrums, it’s much more effective to create your own template. In other words, this timeline is great when you’re asked to present your team’s duties or explain them to someone unfamiliar with your work. For those of you who love crunching large data sets and organizing yourself with detailed spreadsheets, these are the perfect timeline templates. From organizing the elements of your projects in basic rows and columns to tracking your data in tables which then automatically update graphs, these entries all focus on letting you lay out every detailed element which makes up your projects and timeline. California State University Northridge isn’t what sprang to mind when I set out to find the best timeline templates, but with a little tweaking, their historical timeline is a great base for laying out your tasks and how they overlap. Much like other spreadsheet timeline templates, a graph is generated based on the data you put into a table, including the name of each point (or task) on the timeline, their star point, and end point. However, the graph generated is this time on a separate sheet to the data table, meaning that you don’t have to awkwardly scroll past the table every time you want to check or present the graph. 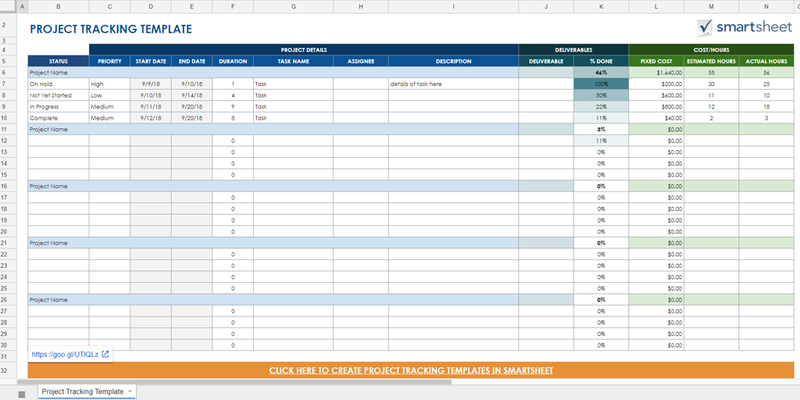 Whether you’re creating a personal timeline to see your workload over the coming months, showing when various teams will be working on a project, or just breaking down a project into bite-size tasks, I’d highly recommend giving this spreadsheet template a try. 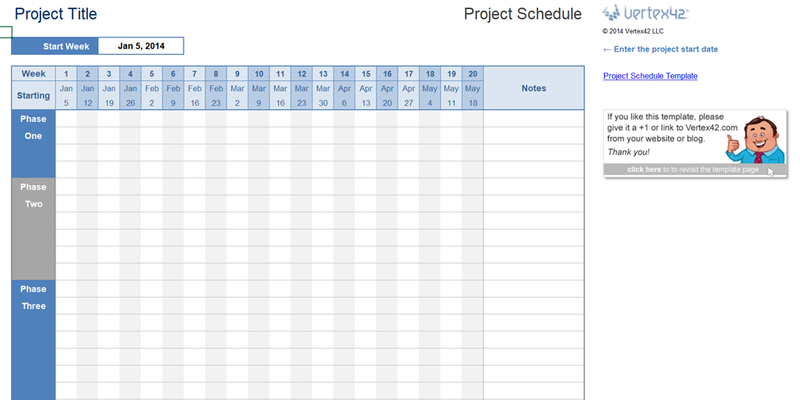 Smartsheet‘s first entry on this list lets you break up the timeline for an individual project in Excel and color code your tasks based on the phase they’re in. It leans heavily on visual elements rather than text, which makes it great for overviewing your project as a whole, but not so good for explaining your tasks or project beyond basic names and labels. It’s also very easy to edit – task names can be edited and the bars which show the length of the task can be dragged to increase or decrease their size. 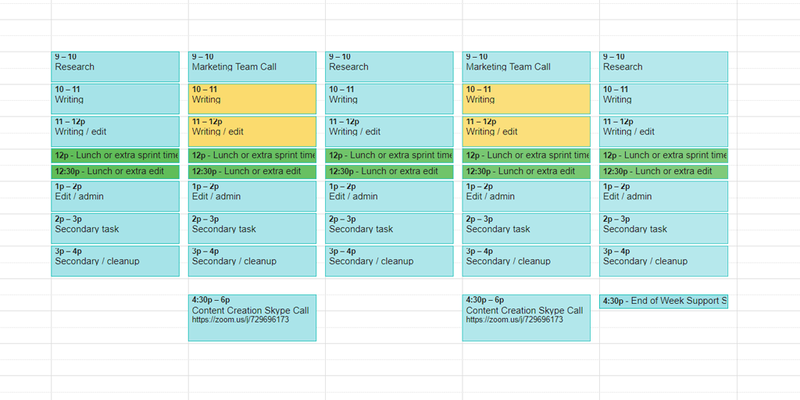 You can’t, however, easily edit the number of tasks in each phase without giving yourself extra editing work. If you’re okay with the project task list as it is displayed then that’s not a problem, but adding new rows to your phases messes up elements such as the bar showing the current date. Vertex42 enters this list again with a solid project timeline spreadsheet – this file is actually a few templates combined, each with different time scales to let you tackle your projects in the appropriate amount of detail. One version is for a weekly schedule, one for a monthly, and there’s also a sample version to demonstrate how to set it up effectively. All versions of this template are easy to edit due to just being a color-coded spreadsheet, but they’re visual enough to see the length of all of your tasks at a glance. There’s even an extra column to add notes for each task, making it much more useful for items that need a little extra explanation. 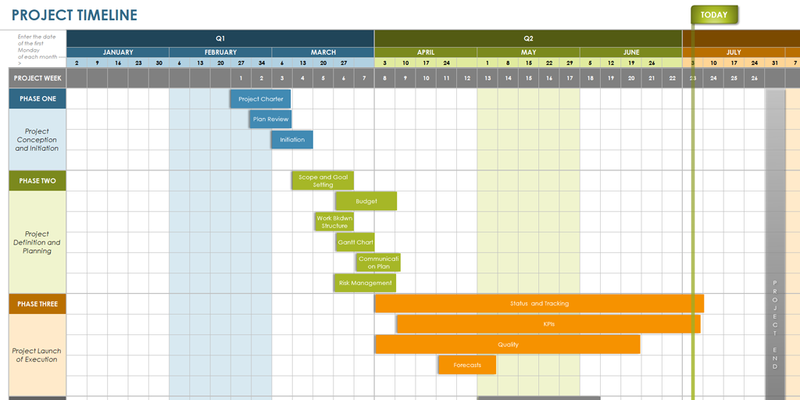 This Gantt chart timeline template is great for organizing your Excel projects with colorful visual elements. By filling in the tasks you have and their start and end dates, this Smartsheet template automatically figures out how long the task will take and updates a graph to represent that time visually. As with many others on this list, there sadly isn’t any room to expand on the task beyond a name (you can’t note down any detail at all, aside from creating a new sheet or linking to extra resources). However, if you want a quick and easy way to visualize your task or project list and how the items overlap, this is a great choice. Although visually this is much more basic that the previous spreadsheets, this Smartsheet template is a dream for anyone looking to delve into the data behind their projects. What it lacks by not having a graph, this spreadsheet makes up for in the various columns for details like your tasks’ names, priority, start and end dates, status, description, deliverables, and more. Although it’s admittedly a “timeline” in a fairly loose sense, the power this gives you with planning your projects and predicting its timings is massive. Whether you’re looking for a way to present a project proposal with a large amount of supporting data or you’re just looking to effectively track your projects as time goes by, this is a fantastic choice if you’re not too fussed about visuals. Click here to get this template. This timeline template is fantastic for anyone who wants to write everything in a single spreadsheet. 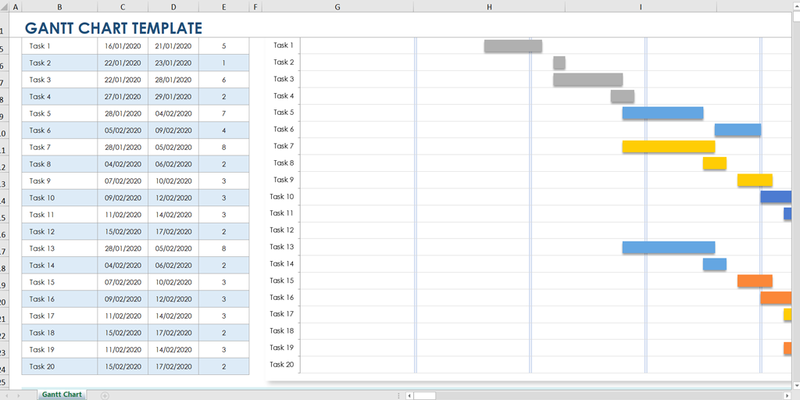 Like the other spreadsheet timelines here, this lets you break down your projects into smaller tasks and automatically generates a graph to represent the time they’ll take. However, Vertex42’s Gantt chart template has a graph which covers every week spanning a two-year period, meaning that you can easily add new rows to keep expanding upon this single template for that entire time. If you’re set on creating a single, united spreadsheet to track your projects and the time each task took to complete (or to predict the time spent in advance), this template has you covered. Didn’t find your perfect timeline template? Why not create your own? Everyone’s different, and it’s important to get a template which suits your timeline, otherwise your efforts could well go to waste. Try out a couple of the templates above to get a sense of what works for you, and look forward to your organized and productive weeks to come. How do you prefer to organize your timeline? Are visuals more important than in-depth data when creating them? Let me know in the comments below. Do you have some timeline tools / apps for Mac / iOS? I want to create a timeline for the self publishing process of my first forthcoming book on tea. Working for a refrigeration company, the project schedule is the best for me. Because our workload is heavily dependent on any project. I am an attorney. There are facts and quotations I would like to put into a linear timeline. It needs to be very specific about dates and align reading to either a quotation or a fact. 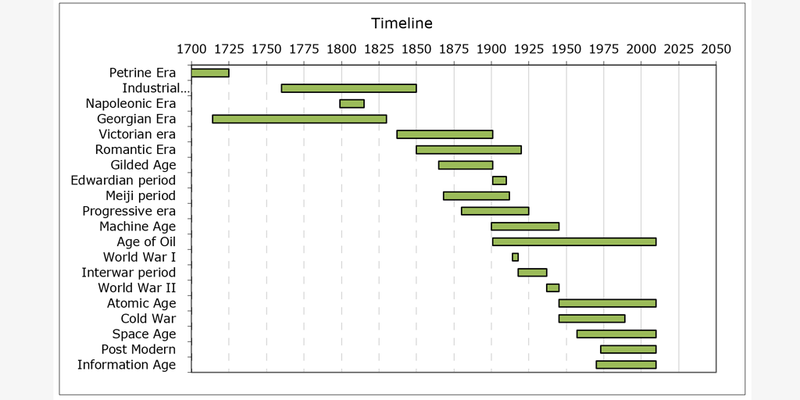 It seems like the most basic linear timeline ever but I can’t seem to find one. Additionally, if there are more than one fact or quotation on the same day I need the drop-down line to be able to distinguish different events on the same day. Can you suggest one for me please? Hi Scott! Thanks for commenting. Since you can’t find one to fit your needs, you might want to have a look at some timeline creation apps. For example, this one: https://timeglider.com/ — it looks like it’d be perfect (and free). I want to create presentation of multiple projects which involves multiple phases in each project and add milestones to it. 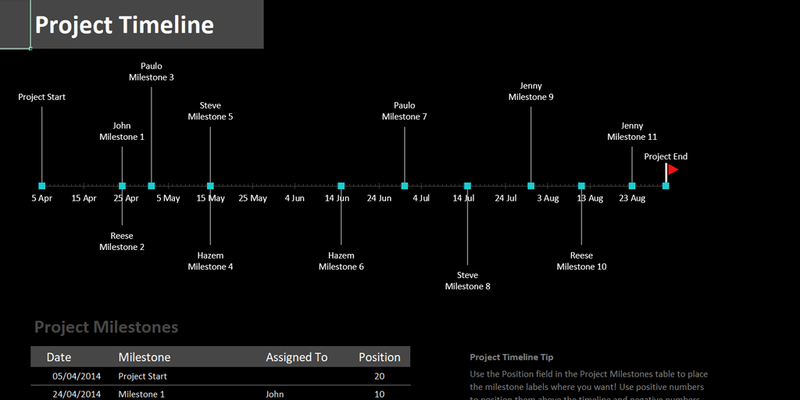 Project Milestone timeline chart (the black one). The data labels on the chart are not interactive. In the downloaded template they all show [CELLRANGE] [CATEGORY NAME] right now. Do I have to manually change them in the chart or is there a way to link them with the table? Aeon Timeline is all I need. Ben this is amazing, thank you! 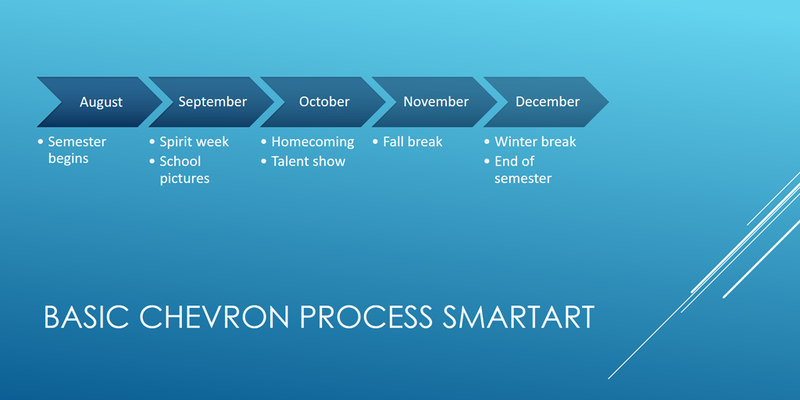 I am a very busy and ambitious college student, a timeline is a life saver! I don’t mean to impose on your time, but would appreciate any guidance or tips you could suggest. algo más libre de riesgo . ¿Tiene alguna recomendaciones? Hola, Tienes problemas con tu blog? Para mi, WordPress es mejor que los otros opciones, pero es un poquito complicado. Si tienes ninguna problema con las cosas informatica, WordPress es un buen elegir. Un opcion mas simple es Squarespace. Tengo un Squarespace blog tambien y me gusta mucho – muy simple y muy rapido. Un otro alternativo es Medium – pero depende que quieres un blog en un plataforma or en tu propio web sitio. Medium es gratis, WordPress y Squarespace tienen cuotas mensual.